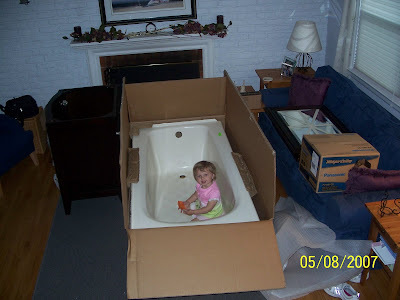 I was so excited when the bathroom store called to say our loot was being delivered today. I was getting a wee bit nervous that work had started and we didn't have our stuff. 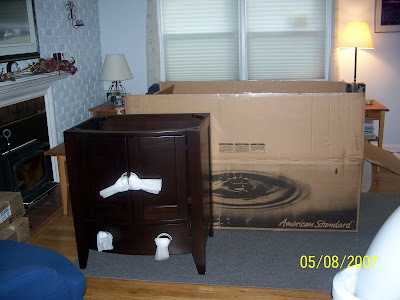 In the delivery were: the tub, the exhaust fan, the vanity cabinet, and the wall mirror/medicine cabinet. Unfortunately the toilet was wrong... so it went back and they are ordering the correct toilet. Fingers crossed... I'm told it should be in by Friday. We'll see. The sink/counter top is not ready yet. I knew that before delivery though. Not worried. We won't be needing that for a while anyway. The best part of this delivery (to be read with sarcasm) is that since we don't have a garage... all of this crap (crap that I LOVE) is now sitting in the living room. Sounds fun right??? Here are some pictures and a video. 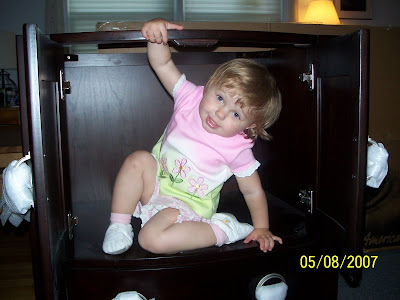 You can tell that Zoe, aka "the littlest contractor", is already loving our new stuff. Imagine when water is involved!!! Sorry that the video isn't great quality. Unfortunately the window,sunshine, and lamp were behind Zoe. I didn't want to move though, for fear of Zoe taking a flying leap out of the cabinet. And also because Zoe rarely gives me the opportunity to catch her counting or saying ABCs on video.